Grain Farm Income Outlook for 2019: Negative Incomes Ahead? In 2018, many grain farms in Illinois will have incomes above $70,000 per farm, the average from 2013 to 2017. Incomes in 2019 could be negative on many farms. While scenarios exist that result in near average incomes, it seems best to plan for negative incomes on grain farms in 2019. Income from 2018 should be saved to cover potential losses in 2019. 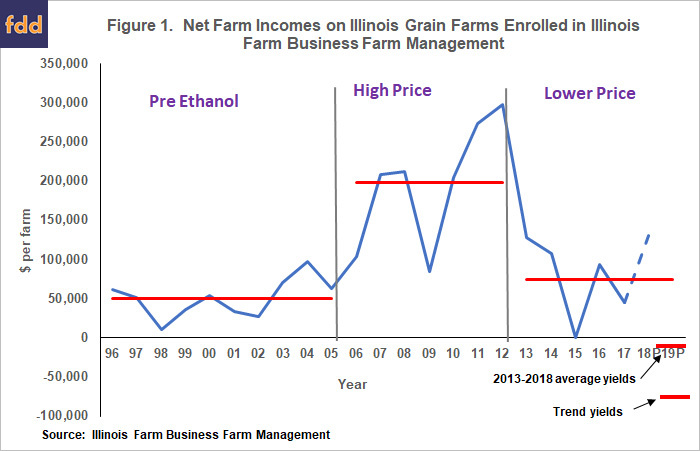 Figure 1 shows average net incomes on grain farms enrolled in Illinois Farm Business Farm Management (FBFM) from 1996 to 2017. Projections also are shown for 2018 and 2019. As can be seen, income has varied over time, with three distinct periods. From 1996 to 2006, commodity prices were low relative to the later periods, and net farm income averaged slightly over $50,000 per farm. From 2008 through 2012, corn and soybean price were higher because of increasing use of corn in making ethanol, continuing growth in exports of soybeans, and shortfalls in productions in places around the world. During the 2006 to 2012 period, incomes averaged $198,000 per farm. Since 2012, commodity prices have been lower because of slowing growth in corn used in producing ethanol and high yields across many producing areas in the world. In 2018, concerns increased over whether soybean exports would continue to grow. From 2013 to 2017, farm incomes on grain farms averaged $75,000 per farm. In 2017, net income was lower than the 2013-2017 average at $46,000 per farm. Exceptional yields. The U.S. Department of Agriculture (USDA) is projecting record corn and soybean yields in Illinois (see Crop Production, USDA). The Illinois state corn yield in 2018 is projected at 210 bushels per acre, 9 bushels higher than the next highest yield of 201 bushels in 2017. The 2018 Illinois soybean yield is projected at 64 bushels per acre, 5 bushels higher than the next highest yield of 59 bushels set in 2016. These high yields will increase 2018 incomes (farmdoc daily, September 5, 2018). Market Facilitation Program (MFP) payments. MFP is a Federal program providing partial compensation resulting from losses caused by recent trade disputes (see farmdoc daily, November 27, 2018, for more detail). MFP makes payments based on 2018 production with per bushel rates at $1.65 for soybeans, $.14 for wheat, and $.01 for corn. The $1.65 per bushel payment for soybeans adds significantly to 2018 incomes. WASDE current midpoint of the 2018 soybean price range is $8.60. Adding a $1.65 MFP payment to $8.60 results in an effective price for soybeans of $10.25, well above average price farmers have received for soybeans since 2014. Opportunities to price 2018 production at higher prices. Before May of 2018, there were opportunities to price soybeans in the high $9 per bushel range, with some rare opportunities to price grain above $10 per bushel. Since the end of May, cash soybean prices have declined to the mid-$8 range, with some cash prices falling below $8 per bushel (see farmdoc daily, July 31, 2018, for a discussion of price declines). Many farmers priced a portion of production before May, resulting in a higher selling price then would occur if no pre-pricing occurred. It seems reasonable to expect about 30% of expected production to be priced at higher prices (see farmdoc daily, May 15, 2018, for a discussion or pre-harvest hedging related to corn). As always, incomes will vary across farms because of yield variability. Some areas had poorer yield than other regions. Also, the amount of grain that was priced before May will impact returns across farms. Rising costs. Non-land costs of producing corn and soybeans will increase in 2019, led primarily by fertilizer price increases (see farmdoc daily, September 25, 2018). Anhydrous ammonia prices were over $60 per ton higher in the fall of 2018 as compared to the fall of 2017. Ammonia prices have continued to increase since the fall. Overall, the era of decreasing per acre costs appears to have ended (farmdoc daily, June 21, 2018). Lower soybean prices. Soybean prices averaged in the high $9 per bushel range in 2016 and 2017. Expectations are for lower soybean prices in 2019. Current fall bids place soybean prices near $9 per bushel. It is possible for soybean prices to fall further below $9 per bushel if yields are at or above trend in either South America or the United States. To illustrate the potential for lower incomes, 2019 projections are made using a $3.60 per bushel corn price and $8.50 per bushel soybean price. Non-land costs are increased by $25 per acre for corn and $10 per acre for soybeans over 2018 levels. Cash rent levels are assumed to remain the same in 2019 as they were in 2018. Projections are made with $7 per acre of Price Loss Coverage (PLC) payments. Incomes projections are made at 1) trend yields and 2) above-average yields. From 2013 to 2018, actual yields in Illinois have average 20 bushels per acre above trend for corn and 6.5 bushels above trend for soybeans (see farmdoc daily, December 11, 2018, and January 3, 2019). These higher yields raised incomes in recent years. A return to trend yields would result in lower profits. At trend yields — 20 bushels per acre lower than in recent years for corn and 6.5 bushels lower for soybeans — 2019 average net income on Illinois grain farms is projected at -$55,000 per farm, a disaster level of income that would result in substantial reductions in working capital and severe erosions of financial position. Some farms would face financial stress. A -$55,000 would be a much lower income than occurring in the 1980s during the height of the farm financial crisis. Higher yields like those experienced in recent years would result in average net income being -$3,000 per farm. This income would be slightly worse than the 2015 income (see Figure 1). At this income level, erosion of financial position would occur on most farms. Prices increase to $4.00 per bushel for corn and $9.50 per bushel for soybeans, with yields above trend like they have been in recent years. Prices at these levels are possible. For soybeans, a $9.50 price likely would require lower than expected yields in both Brazil or the United States, and some resolution to the trade dispute with China (see farmdoc daily, January 14, 2019). A continuation of the Market Facilitation Program, with yields above trend. Continued MFP payments would add income. The Trump Administration has stated that MFP payments will not continue in 2019. At this point, it seems likely that net farm incomes will be very low in 2019. Negative average incomes across Illinois grain farms are possible in 2019. As often happens in agriculture, conditions can change, resulting in a brighter outlook. Still, it seems prudent to plan for low and negative incomes on grain farms in 2019. Saving 2018 income and building working capital seems like a good strategy for combating potentially low income in 2019.